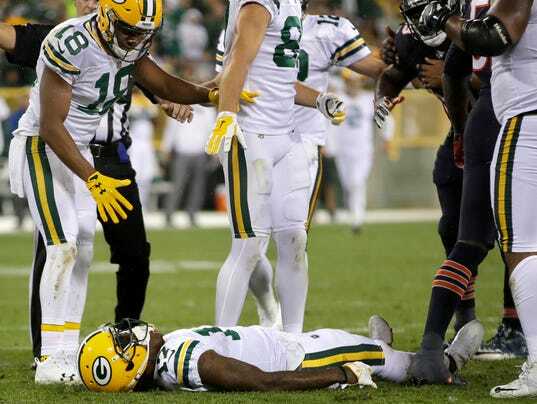 ~GREEN BAY – Receiver Davante Adams is in the concussion protocol after taking a vicious hit to his head from Chicago Bears linebacker Danny Trevathan, Green Bay Packers coach Mike McCarthy said Friday. McCarthy said Adams was out of the hospital after being evaluated overnight for head and neck injuries. McCarthy visited Adam during the night, he said. Before leaving the locker room, receiver Jordy Nelson also said he planned to visit Adams at the hospital. It remains unclear what kind of punishment Trevathan receives from the league after smashing the crown of his helmet into Adams’ facemask in the third quarter of the Packers 35-14 win Thursday. A significant fine would seem likely, if not also a suspension. Adams lays motionless after Trevathan’s vicious, cowardly cheap shot knocked him out. Given the NFL’s push to eradicate such head-hunting hits from the game, McCarthy was asked if it troubled him Trevathan was not ejected. McCarthy would not delve into the rules, but said he expects the play to be closely evaluated. McCarthy said he was impressed with how well his players kept their composure continuing with the game after such a scary collision. “I think you have to give the players the credit for their focus there,” McCarthy said. “Yes, it’s definitely unnerving any time a player’s on the field, and obviously when they bring the board out, it doesn’t matter what color uniform you’re in, it’s an unnerving moment and nobody wants to see anybody go through that. Especially, players don’t want to see a fellow player go through that. I think just the ability they have as professionals kicks in.